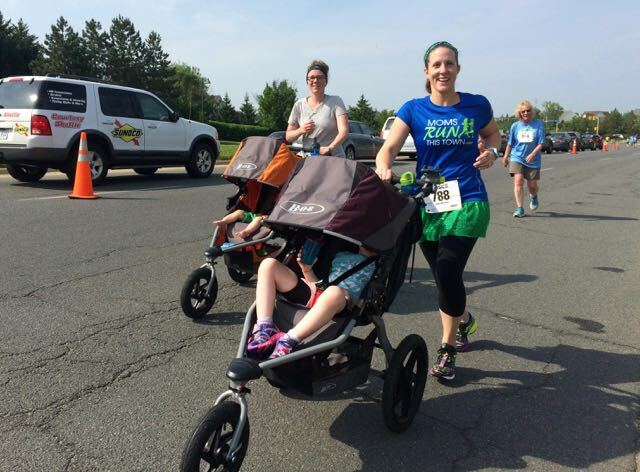 Last year I was out of town for Carter’s Run, but I introduced you to Carter and the event named after him when I interviewed Carter’s mom Lisa, my Moms RUN This Town friend. 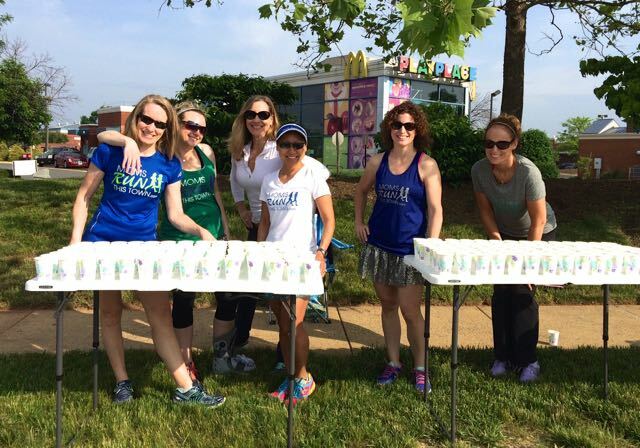 This year I didn’t run, but I did something even better; I volunteered with a group of my friends at our first ever MRTT water stop! You can bet we had a ton of fun and did a lot of goofing off! Erin picked Vicki and me up around 7 AM for the short drive to the elementary school so we could check-in and confirm the location for setting up our tables. 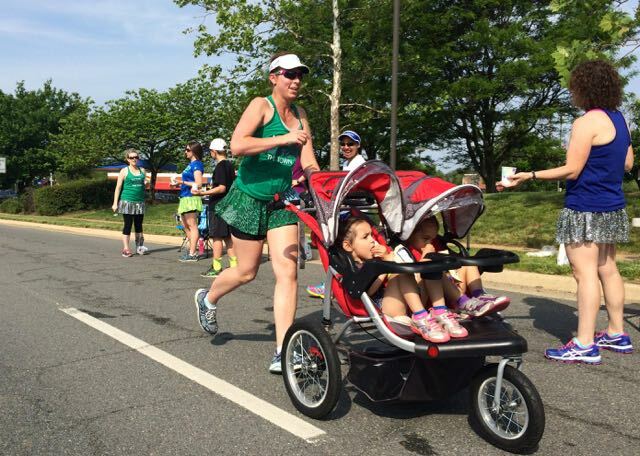 After a quick hug, and wishing Lisa (Carter’s mom and race director) a happy birthday, we were off! We got to our spot around 7:20, and really needed to hustle to get our tables set up in time for the 9 AM race start! 😀 Are we efficient or what? We go by the motto: the early bird catches the worm, and has more time for shenanigans! And get photo-bombed by a grand-slam hitting young man while having a picture taken of the bloggers present! Nate and his mom had to leave the water stop early to go to his baseball game and he hit a grand-slam! Congrats, Nate! You already know Erin and me, so I’d love to introduce you to our running buddy Michelle who writes The Fit Hipster, which chronicles her recover from her recent hip surgery. Finally it was show time! First by the water stop was a very speedy man way ahead of everyone else. 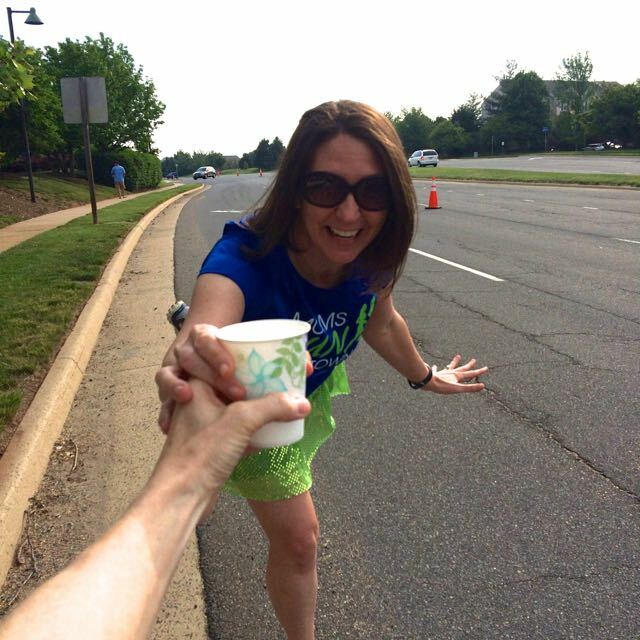 With twelve outstretched hands holding water cups to choose from, he grabbed a cup of water from Erin, and boy was she pumped. 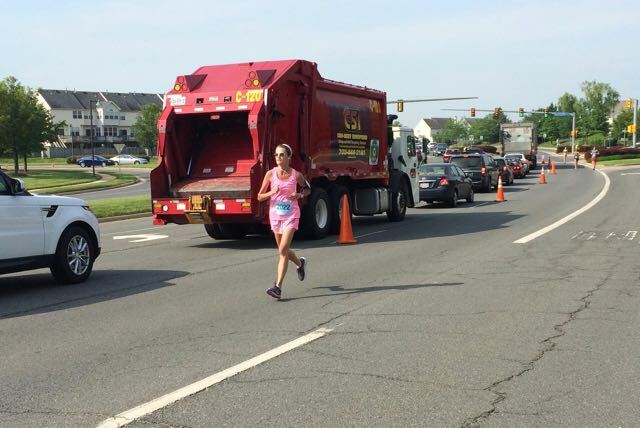 Not too far behind was our MRTT friend Colleen who won the women’s 10K! Then Misty and the twins…. And then came the little girl in the tutu! There were so many cute children, but this little lady’s tutu made our day! 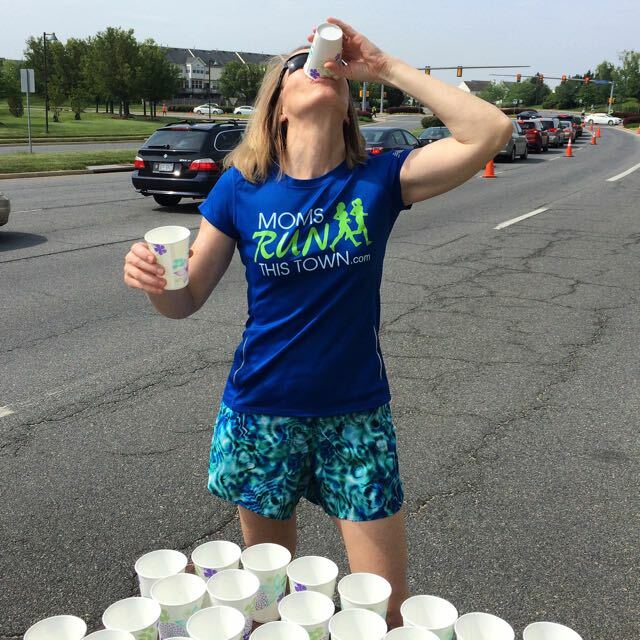 After all of the runners came through, we didn’t want to waste the water so I chugged the leftover 200 or so cups! 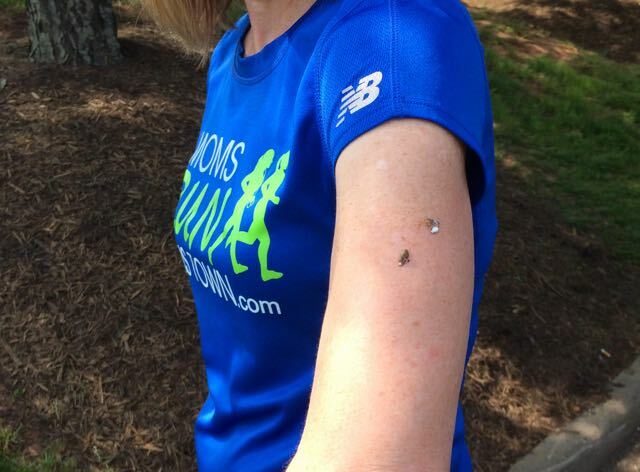 And then a bird pooped on my arm – but I hear that’s good luck. Good luck for whom – me, or all of my friends who didn’t get pooped on? Except for the bird poop, it was a fabulous day! 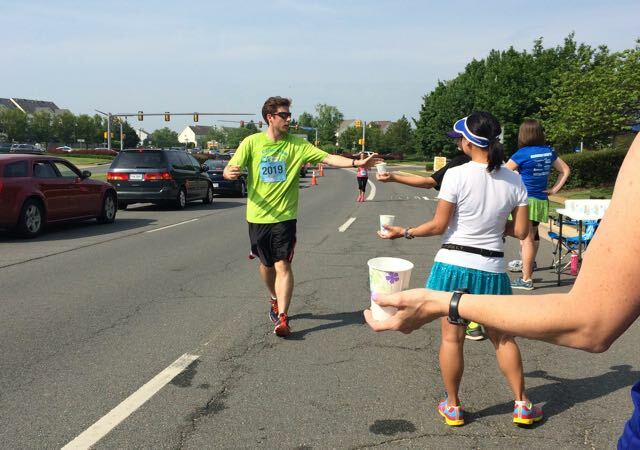 Have you volunteered at a race? ~ This was my first time. Even though I was the race director of The Tortoise and The Hare 8K for six years, I was paid for my hours. Have you ever been pooped on by a bird? ~ Today was my first time. 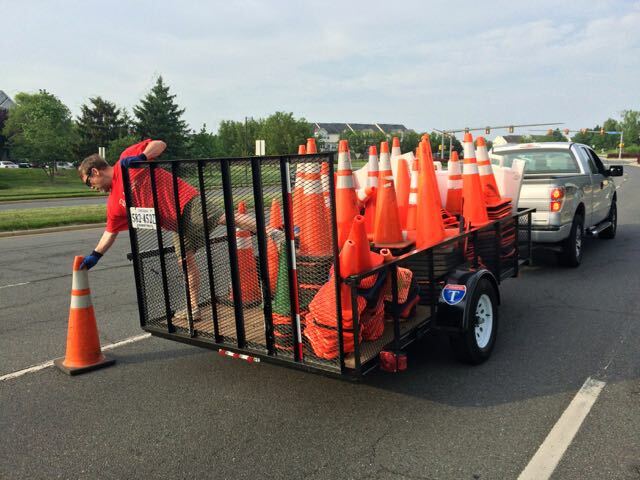 I’ve volunteered at MCM (bag drop off), Cherry Blossom (packet pick up) and the Reston Sprint Tri (course marshal). 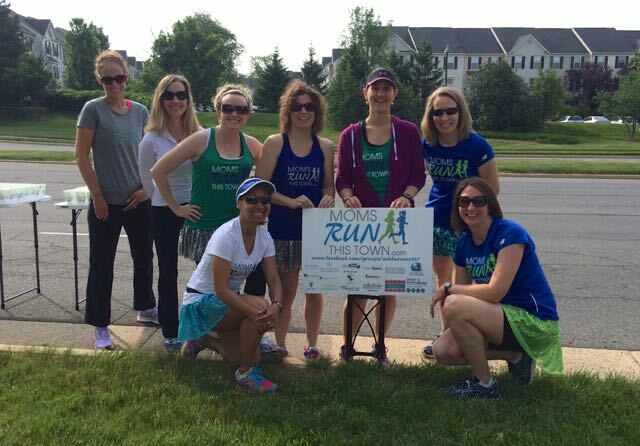 Had a great time at all, but manning the MRTT water stop with you fabulous ladies was definitely the most fun! Oh, and yes to the bird poop! Sounds like fun! Love the little girl in the tutu! It was a blast! 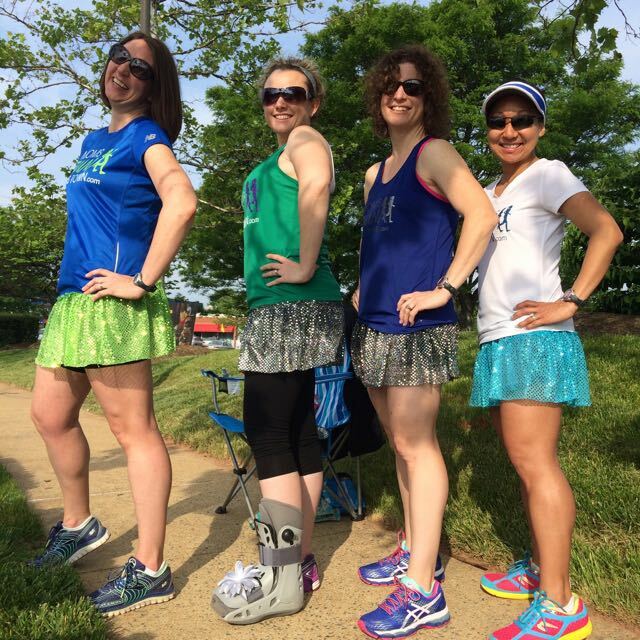 And of course, being with my running friends helped make it even more fun. 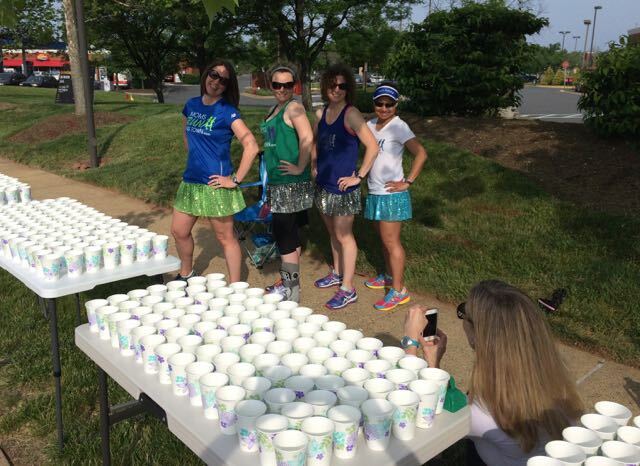 I’ve done a few water stops with our MRTT group. They are lots of fun and lots of work for the bigger races. Great way to repay the volunteers who do it for us. 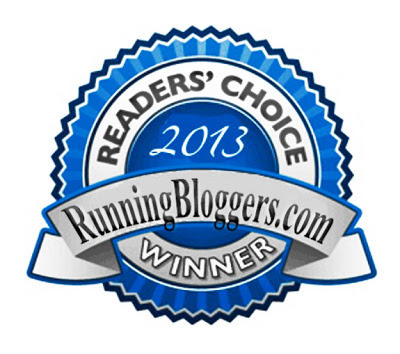 We kept reminding ourselves how much more laid-back it was than working a larger race. We had tons of time to goof off, something I can’t imagine during the Cherry Blossom! this was soooo much fun! Great recap as always! Thanks, Erin! I missed seeing you and Tracy this morning and our little “three times in twenty-seven hours” time together! That looked like a lot of fun! minus the bird poop and I did hear it was good luck because what are the odds that you get pooped on twice??? 🙂 I have volunteered for Disney but only at the expo haven’t made it on the course yet! Have a great Sunday! 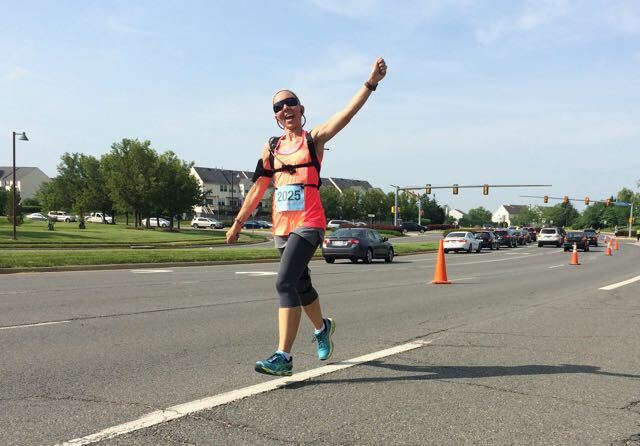 Mary Beth Jackson recently posted…It is an Active Girl’s Weekend! One bird – double poop! I bet volunteering at one of the Disney races’ expos would be a lot of work! I volunteered a few times when I was injured. My job was to put the racers into the computer. 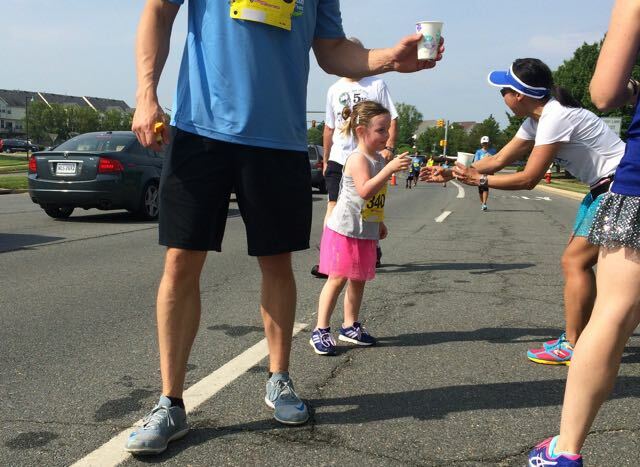 I’ve never manned a water stop. 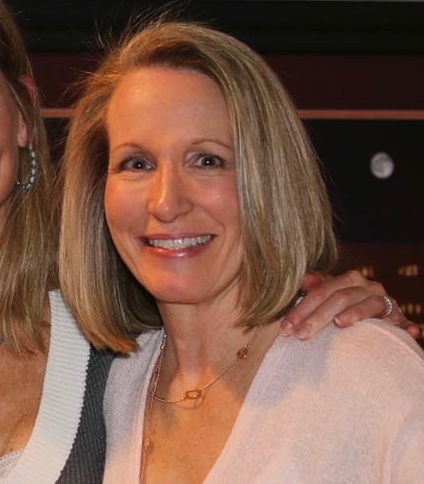 Deb, I had to do a double-take. For a minute, I thought you were wearing a sparkle skirt! So close. Your volunteer job sounds tedious. Oh the bird poop! Ugh. Good on ya for volunteering I really love to help out at races….it’s almost as fun as racing on your own, and no pressure, either! 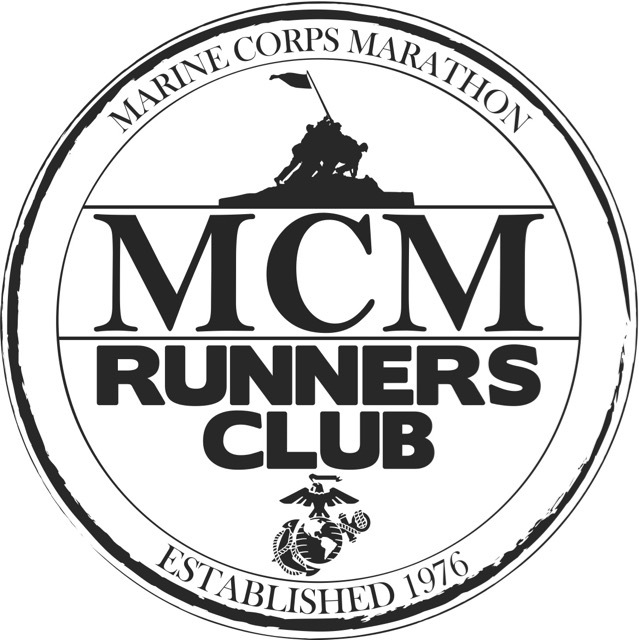 I think all runners should take a turn now and again, especially when we all benefit so much from the help of others whenever we race. What I enjoyed most was seeing how many children were running (and running well) in the race! 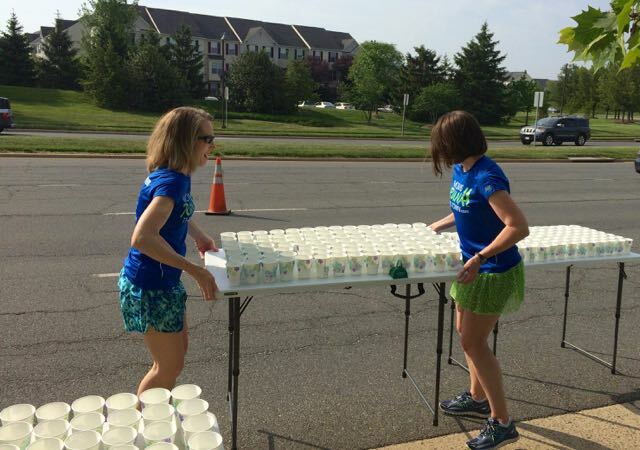 I love volunteering at water stops. It’s a lot of fun! And not so exhausting as running a race. 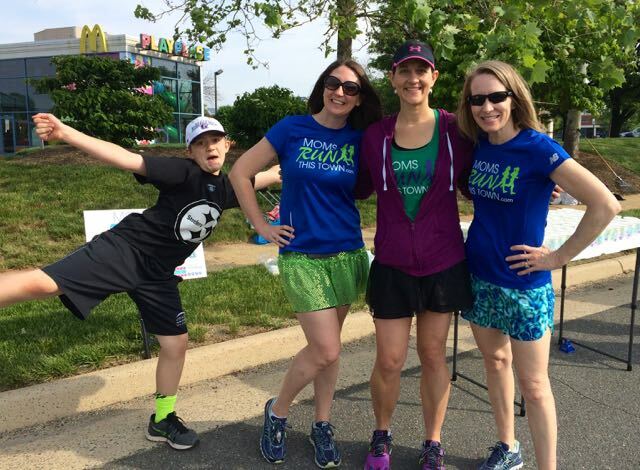 Glad I’m not the only one who recaps volunteering at a race 🙂 It’s a fun experience, isn’t it!? 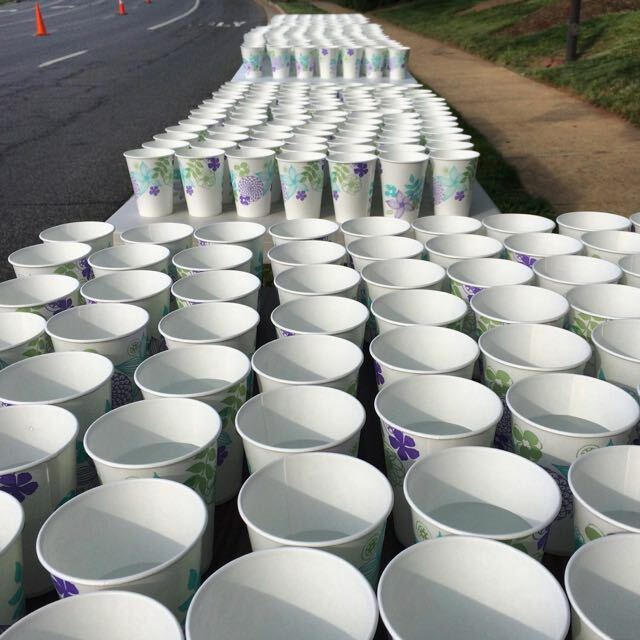 Looks like y’all ran a very efficient water stop – with plenty left to go around. That’s good. Glad you had a good time! P.S. I’ve been pooped on by a bird before. I think it’s mainly a sign of luck for those around you who did not get pooped on! Agreed! It’s good luck for everyone except the poopee! I have volunteer at the cherry blossom race, and army 10 and a few other. Bet experience ever. My son has joined me to get his service ours got middle school. My son volunteered at a few races to get service hours for the National Honor Society. One time he volunteered at a marathon I ran, and it was so fun to see him when I ran by!